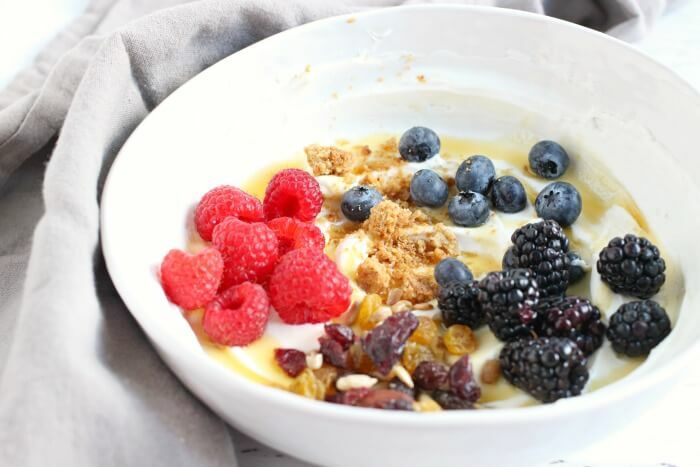 A Yogurt Bowl is the perfect simple and delicious breakfast recipe. 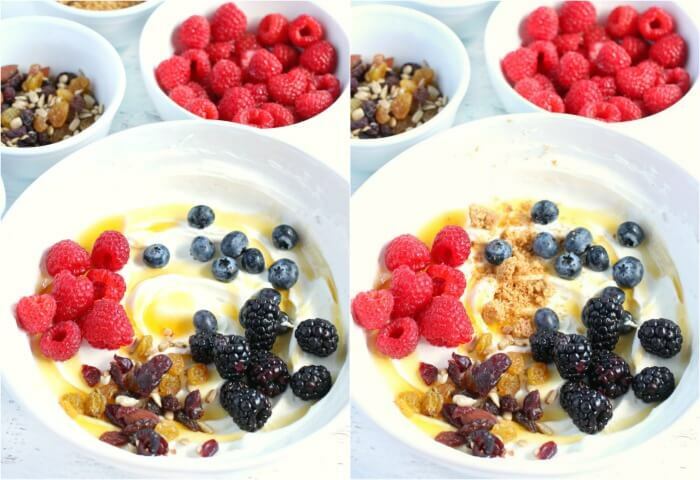 I love making a yogurt bowl for breakfast in the morning. 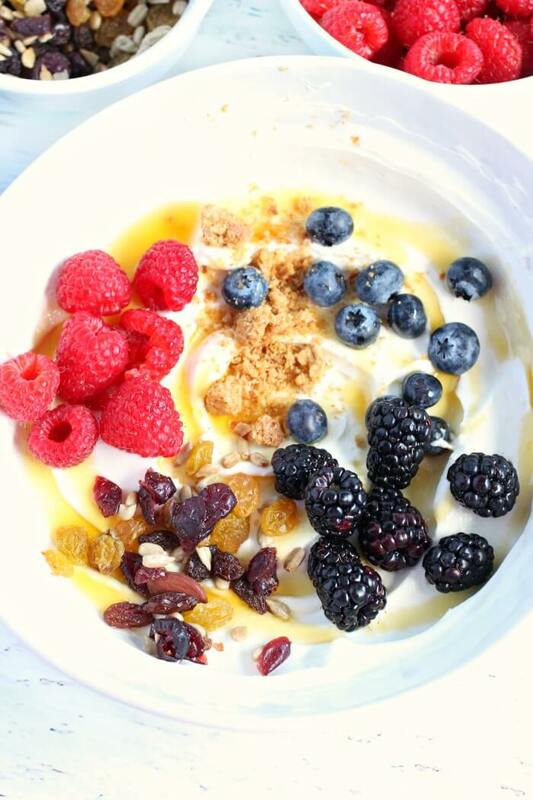 Rich and creamy protein filled Greek yogurt, topped with sweet honey, berries, crunchy nuts, seeds, and granola. Pair your yogurt bowl with a hot cup of bulletproof coffee and some crispy oven bacon. Then use the leftover yogurt with a splash of vanilla to make Greek yogurt pancakes for tomorrow’s breakfast! 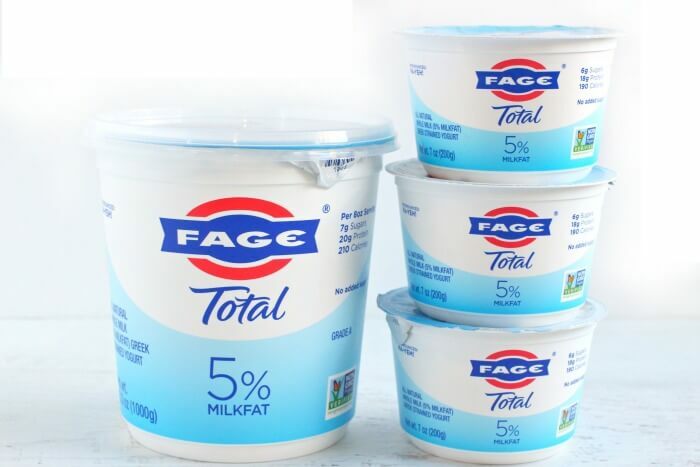 Yogurt – We used FAGE Total Plain Greek yogurt in our bowl. I love that the Greek yogurt is so full of protein and is able to keep me full until lunch time. 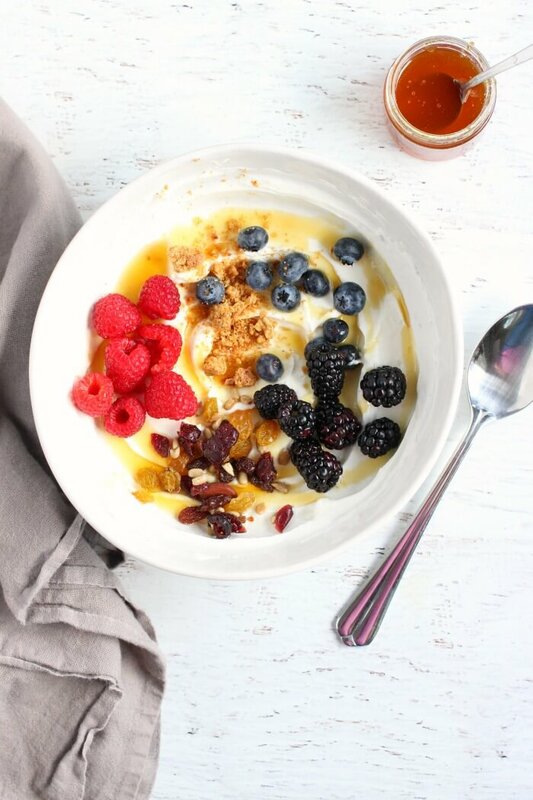 Honey – This yogurt bowl is sweetened with a small amount of honey. I find it’s a good way to sneak in some local honey. Fruit – I like a combination of fresh fruit and dried fruit for the variation in textures. Seeds and Nuts – There are sunflower seeds and almonds in today’s yogurt bowl, but use whatever you have on hand. Nuts and seeds have healthy fats, crunch, and more protein. 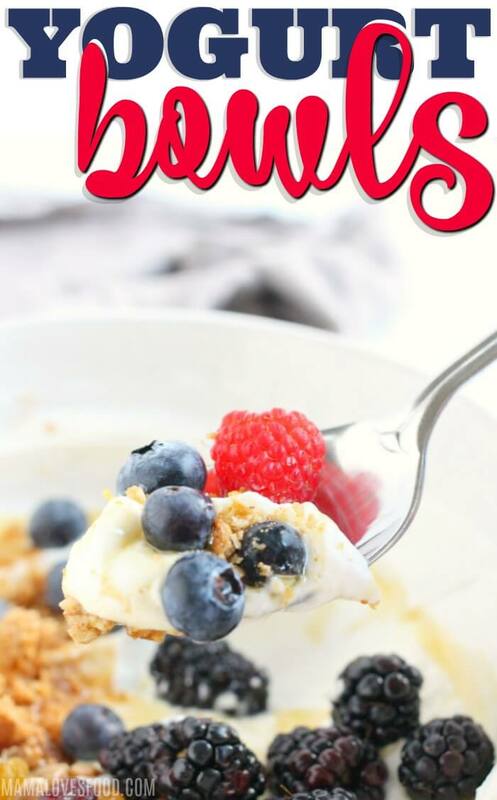 Granola – If you make homemade granola, this is a great place to add it! Or, heck, crush up one of your kid’s granola bars. No one’s judging here! First, scoop your yogurt into a bowl. I like to swirl mine around a little to make it look pretty. This is totally optional. Next, drizzle with honey. It doesn’t take much to sweeten the yogurt, so ease in. Then, top with your selection of fruit, nuts, seeds, and granola. 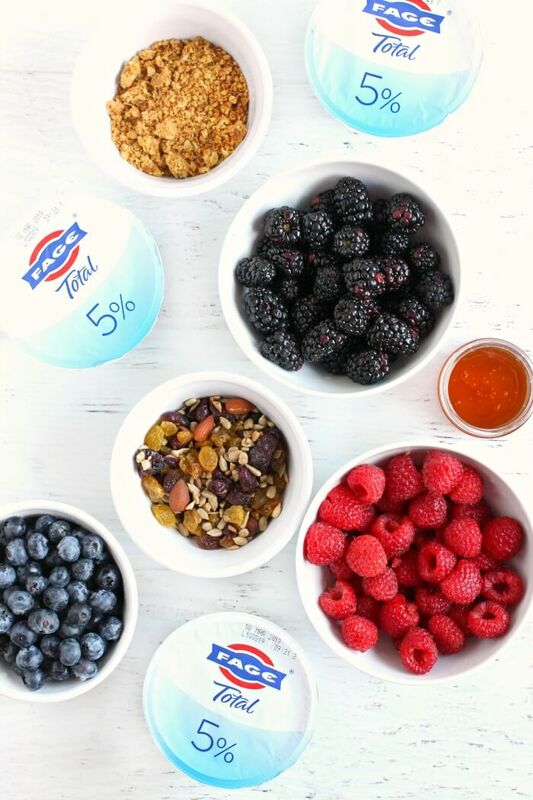 We love using FAGE Total 5% Greek yogurt in our yogurt bowls because it is an all-natural Greek yogurt with a distinctive rich, creamy and delicious taste. 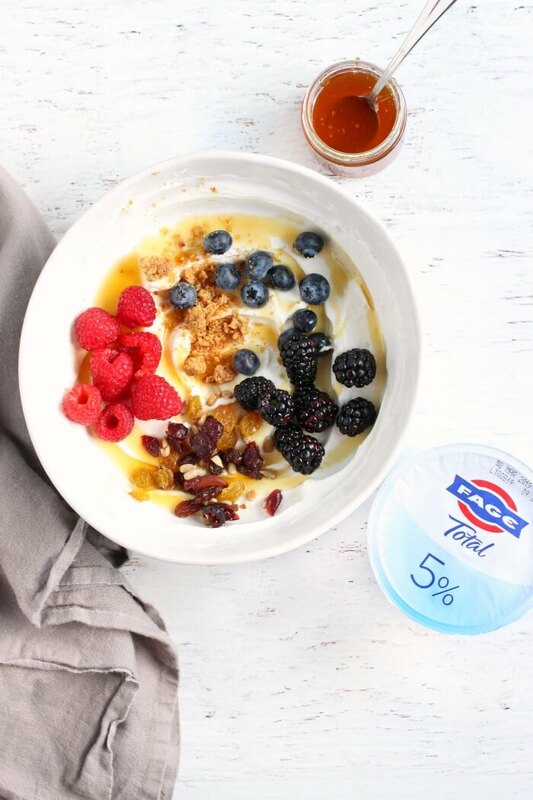 FAGE is Non-GMO Project Verified, has no added sugar (contains only naturally occurring milk sugar), and is protein-rich so it fills you up until lunch! FAGE is made with only milk and live active yogurt cultures, is an excellent source of calcium, and is made with milk from cows that have been fed non-GMO feed. The difference between a yogurt bowl and a yogurt parfait is that a parfait is layered, usually in a clear cup or glass, whereas a yogurt parfait is served in a bowl with a spoon, more like cereal. Flavor and ingredient-wise, there is no real difference between the two. In the battle between yogurt bowl vs yogurt parfait, the bowl always wins in my house because it’s easier to make. We love unsweetened Greek Yogurt for our yogurt bowls because it is super rich and creamy, full of protein, and there is no added sugar. In this bowl we used FAGE Total 5% Greek yogurt. If you like your yogurt sweetened (I do! ), it’s easy to add honey and berries until you reach your desired level of sweetness. 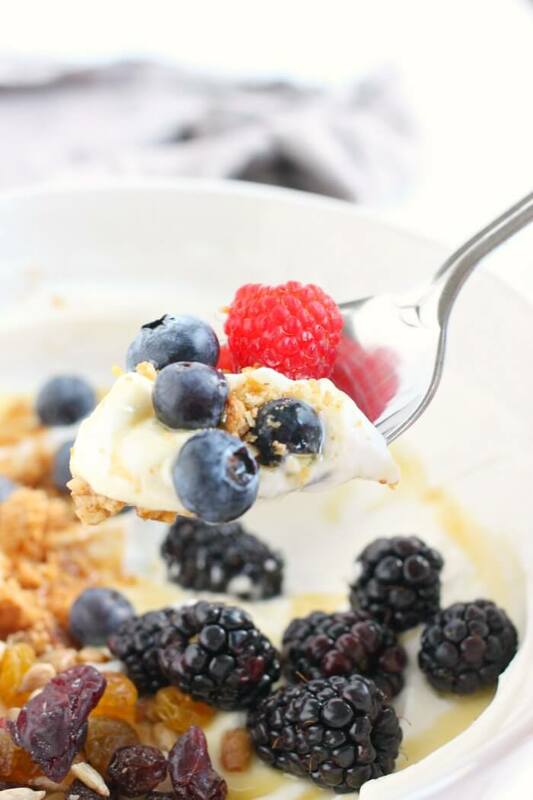 I love a yogurt bowl as a quick and filling breakfast idea, and my kids think they’re the perfect afternoon snack. We also love a bowl as a sweet treat after dinner while we wind down and play games or watch a show together. You can make a yogurt bowl ahead of time. Make sure to store it in a sealed container in the refrigerator. For best results, do not add the granola until you are ready to eat, as it will get soggy. You can make yogurt bowls one to two days in advance. 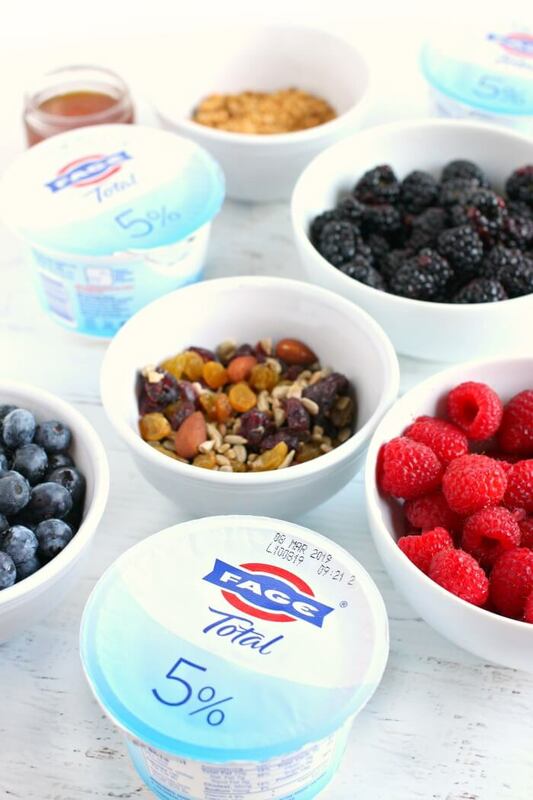 Use FAGE Total Greek Yogurt All Day Long! 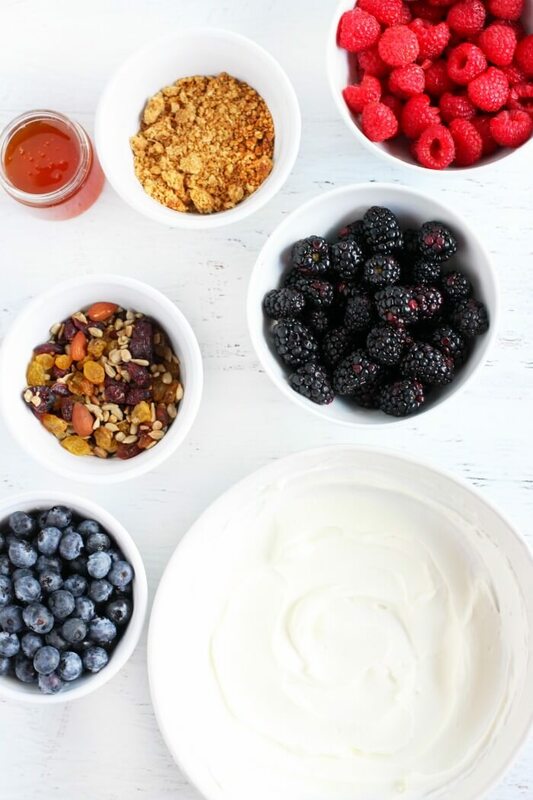 Check out these recipes using FAGE yogurt and then see below how we use it all day long. Try our Greek Yogurt Pancakes when you’re not in the mood for a yogurt bowl! Or swap your regular yogurt for Greek Yogurt in your next smoothie. Try adding a scoop of pico de gallo and a dollop of Greek Yogurt to your eggs in the morning. Swap out the sour cream for Greek yogurt in our Ranch dressing recipe and drizzle it on your salad. Stir some into your Potato Soup and top with green onions, cheese, and bacon for a fully loaded baked potato style soup. Fix some fish tacos and top with a spoonful of Greek yogurt. Swap out the sour cream in our Buffalo Chicken Dip. Mix up half yogurt and half salsa to dip your Taquitos. Sub the sour cream for yogurt in our Spinach Dip for a veggie and protein filled treat. Stir some Greek Yogurt into your Turkey Chili. Top your Enchilada Casserole with a generous helping of FAGE! Add it to your Meatloaf Recipe for a super moist result. Make a batch of Ground Beef Stroganoff with it! It is not necessary to use honey in your yogurt bowl. If you don’t care for the flavor of honey, Greek Yogurt can also be sweetened with just fruit, fruit juice, brown sugar, white sugar, maple syrup, agave, coconut sugar, jelly, jam, or any other sweetening agent. 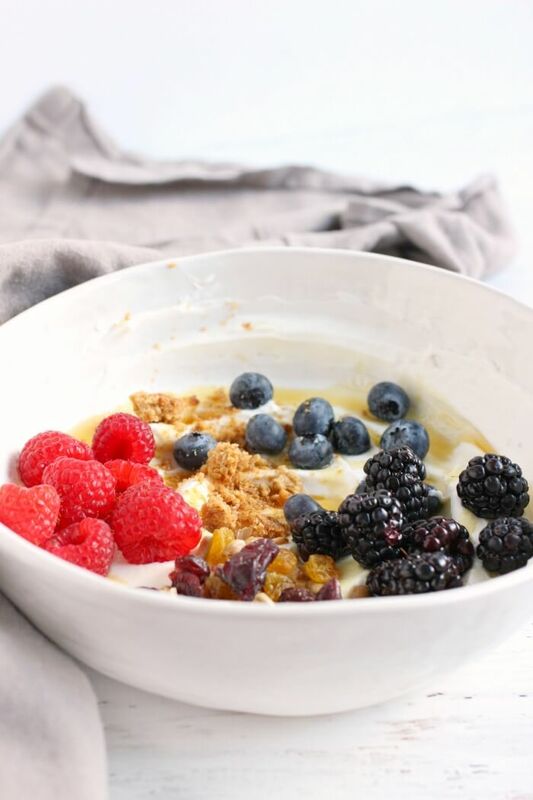 For a completely processed-sugar free breakfast bowl, try using mashed berries! Greek yogurt has a tangy somewhat sour flavor. It is not naturally sweet and is often used as a substitute for sour cream. It is thicker than traditional yogurt and very creamy. My preferred method for sweetening Greek Yogurt is with honey. A little bit goes a long way and it mixes in very smoothly. You could also use plain sugar, brown sugar, agave, or even a spoonful of sweetened condensed milk. ★ Add a dash of vanilla and some Pumpkin Pie Spice for a Fall inspired yogurt bowl. You could even stir in some pumpkin puree to get super authentic. ★ Try it with mango and pineapple (or a scoop of our Tropical Fruit Salad) for a tropical yogurt bowl. ★ Make a banana pudding yogurt bowl with mashed bananas and chopped nuts. 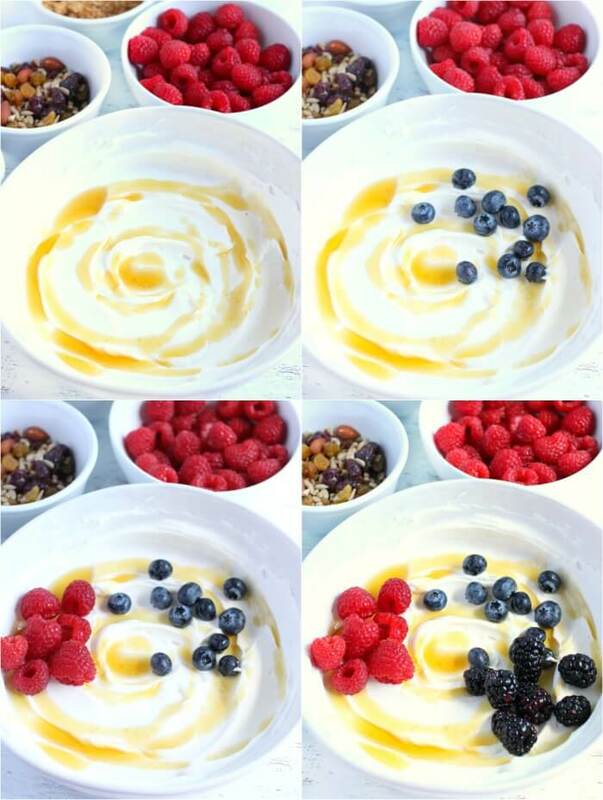 Small bowls – I love a bright white bowl for my yogurt, it makes the beautiful fruit just pop! Spatula – Make sure to get all that yogurty goodness out of the container. Spoons – Are you a large spoon or small spoon person? My husband teases me because I use a teaspoon for everything. Start with the yogurt on the bottom, then drizzle honey over it. 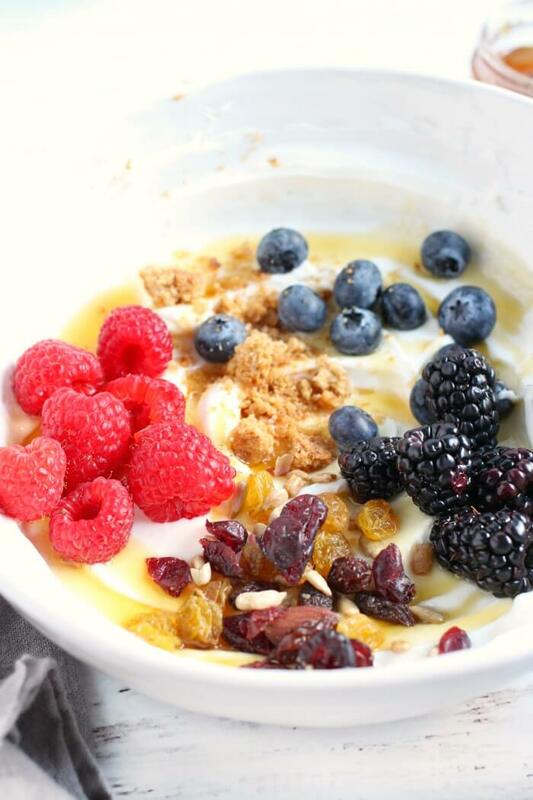 Top with fruit, nuts, seeds, and granola. Such great ideas for a healthy breakfast. Going to eat it this way tomorrow morning.